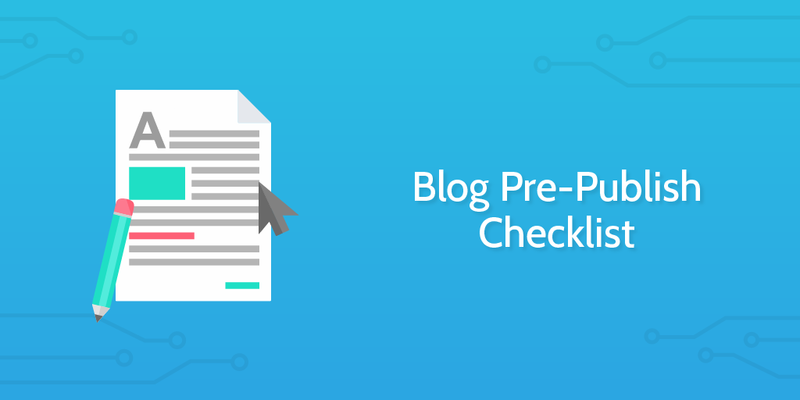 You can automatically trigger this pre-publish checklist to run when your post needs reviewing by integrating Process Street with another app. For example, if you have a Trello column set up called "Run pre-publish", you can use Zapier to trigger a checklist to be run for any card moved into that column. You can even push the URL of your checklist back into the comments of the Trello card! Pre-publish checklists are boring and repetitive especially when you have to run them every single time you're writing a blog post. But, when writing a blog post either personally or professionally, you can often forget simple things from running a spell check to checking all links are not broken. That is why we created this Blog Pre-Publish Checklist, to ensure you never miss anything when creating your blog post. Record the link to the final post using the form field below. If you don't yet know what the link will be, predict it from the slug (which should be your keyword). First up in our blog pre-publish checklist is to run the content through a spell checker! At this time it's also worth saving a copy of your post using the form field below. Once you have this version saved, either copy your post into a word processor or run it internally on WordPress (or similar). Next up, you need to ensure that your post is proofread. Record the people who have proofread your post using the form fields below. Although not always necessary, it's good to have at least two people other than yourself proofread your content to check for errors. If you're using WordPress there is an internal proofreading function. Use this only after you and at least one other have thoroughly looked over the post, just to check for any errors you might have missed. Write 5 headlines to test on social media. Record these headlines (and which is most effective) with the form fields below. Note that you should have written many more headlines than this for the initial post; these are just the titles for social media purposes. Use the results in the future to determine which kind of title is the most effective. More information can be found here on Hubspot. Ensure that there are sub-headings in your post. These should be <h3> tags and used to break the post down into scannable chunks. Ensure your links aren't broken and that they link to the correct location. Use (or edit) the sub-checklist below to ensure that you have the best span of links possible, and record all of the links you make with the form field below. Remember to use affiliate links if you have any, instead of generic ones. Check the formatting of your lists and bullet points to ensure it is standardized. Using lists and bullets is another great way of making your post more readable. In order to ensure that your great content is not let down by sub-par images, you must now check their size and ratio. Images should be at least 1000px wide and ratio 16:9. Now that your images are all sorted, you need to pay the same attention to your video embeds. Once again, ensure that all are working and are the correct embeds whilst recording the videos' links in the form field below. YouTube has functionality on WordPress that allows you to just paste the link without embed code. If you're using another service, you may have to both find the embed code and tweak it so the frame sits nicely on your page. You're almost there - now you need to double check all quotes you have included. Record the source (preferably the person and original content's link) in the form field below. Ensure that you attribute quotes correctly, have <blockquote> tags start and finish where they're meant to. This is pretty self-explanatory; you need to make sure that all of your content is in a consistent format. Next up (if required), have the post approved by the appropriate source. Record the person who approved the post in the form field below. Now you need to quickly check the publish date to ensure that it is correct. Record the publish date using the form field below. Now you need to update the headline of the post to the one which performed best in your A/B tests. Record the final headline in the form field below.